SEC will be assisting an overseas visitor on some analysis he would like to do in the Gobolo cave in Swaziland 18th to 21st May 2018. Gobolo is an extremely interesting cave. 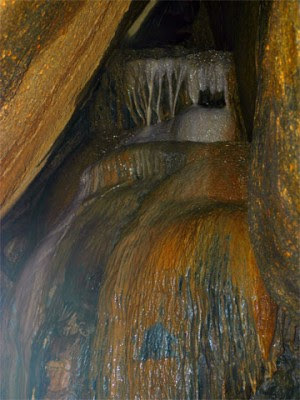 The Ghobolo Cave system is predominantly granite rock – which is VERY unusual as granite does not typically form caves. For this reason typical cave features like stalactites are rare. This flow stone is one of the few features of this type so far discovered in this cave. This will be a SELFCATERING trip - there is a big shopping centre (Checkers/woolworths) very close by where you will be able to purchase any necessary food items. OSHOEK is probably the best border post to use. Ngwenya/Oshoek is the busiest border gate and it becomes heavily congested at certain times, such as at long weekends or when there are special events such as concerts. Queues can take several hours to move and you might think of using an alternative gate at these times to avoid long delays. Please let me know if you are keen to join.